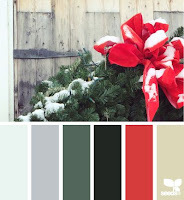 Hello friends...hope you all had a wonderful Christmas! 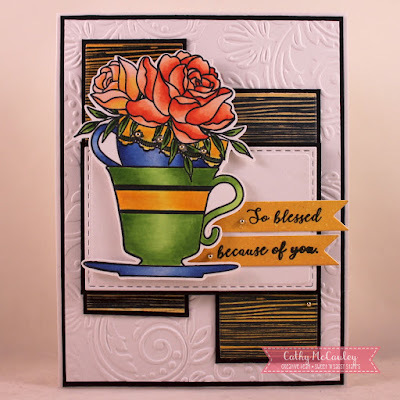 I have two cards I'm sharing over at the Sweet 'n Sassy Stamps Blog today using the Teacup Roses and Wood Backgrounds stamp sets. Creative Nugget: Two panels with a Wood Background stamped over Distress Oxide Inks were mounted to the embossed card front. The Teacup Roses were colored with Copic Markers, cut out and popped onto a stitched panel. A sentiment from the Teacup Roses set was split and stamped on two die cut banners. The design for this card comes from CAS(E) This Sketch. 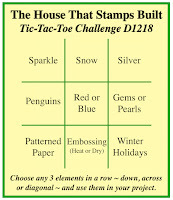 My second sample also uses the Keep in Touch Too stamp set. Creative Nugget: The Copic colored Teacup Roses were again popped onto a Wood Background. 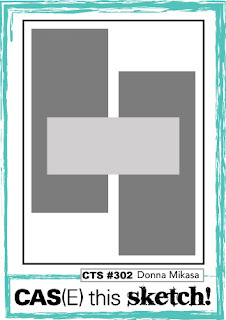 The sentiment on this card is from the Keep In Touch Too stamp set and was white embossed on a hand cut gray banner. Simon Wednesday Challenge - Simon Says: Anything Goes! Thanks so much for stopping by...Blessing for a happy New Year! Hello friends! 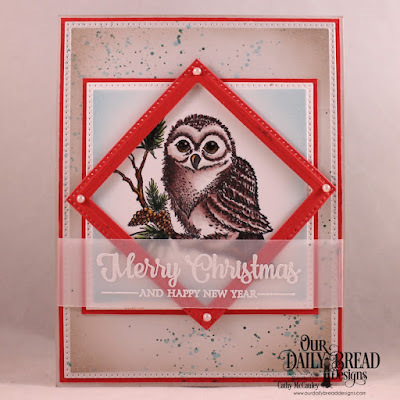 Well "Owl" be...it's time for another Two for Tuesday feature over at the Our Daily Bread Designs Blog. I used the owl from the new Winter Greetings stamp set for both of my cards. Creative Nugget: Distress inks were sponged and splattered on a panel cut with a Pierced Rectangle Die for a very simple background. 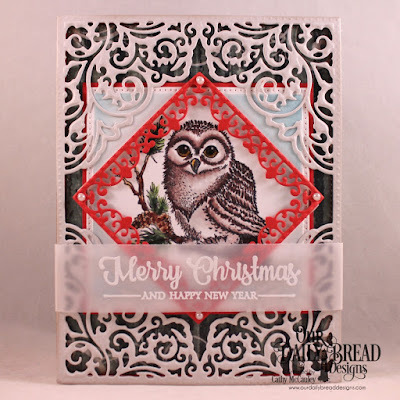 The owl from the Winter Greetings stamp set was colored with Copic Markers and the panel cut with a Pierced Square Die. 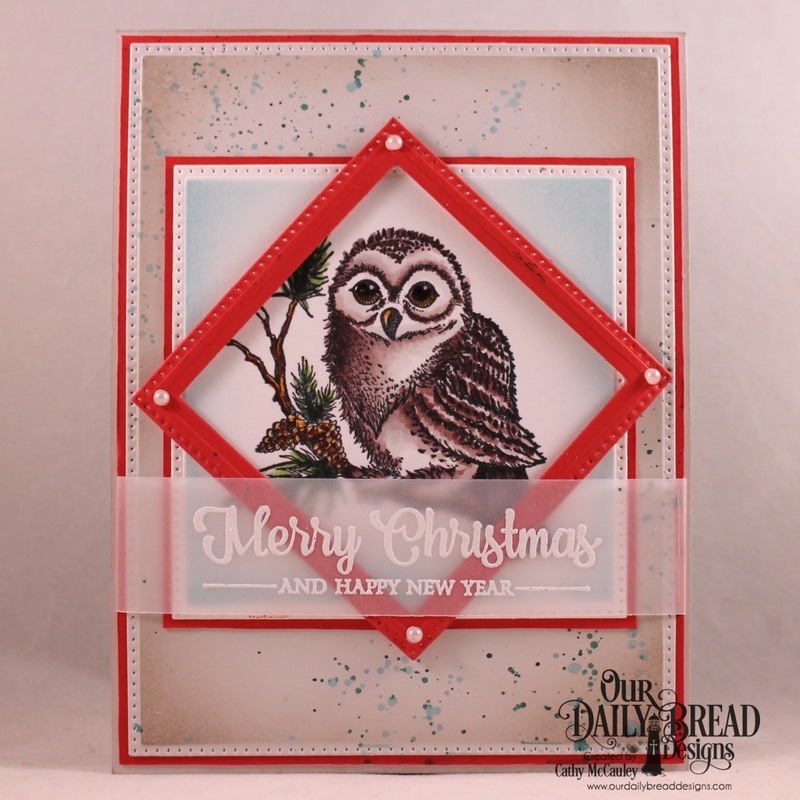 Pierced Square Dies were also used to create a simple frame around the owl. 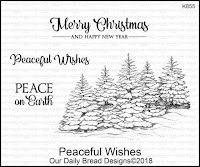 I love the font on this sentiment from the Peaceful Wishes stamp set and white embossed it on a vellum band that was wrapped around the front of the card before it was mounted onto the card base. A few pearls were added to finish the card. Creative Nugget: A panel of paper from the Christmas Collection 2017 Paper Pad was cut with a Pierced Rectangle Die and was used for the background on the stepped up version of the card. This time Lacey Corners Dies were used to frame the owl. Good morning, friends! 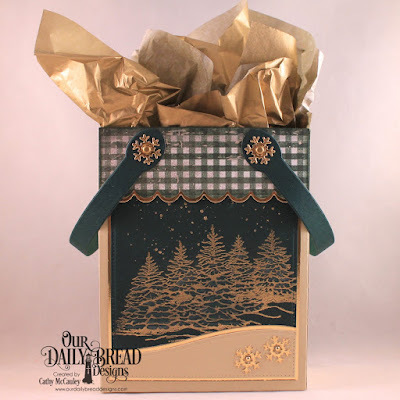 Today we are taking another look at the ODBD December 2018 Release. 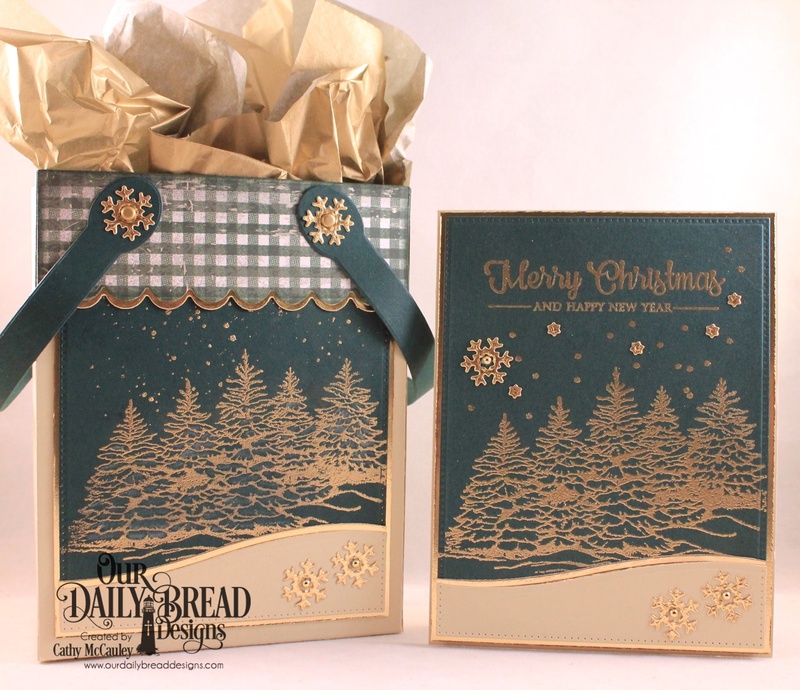 Some of the new product were used to make a card and gift bag set. 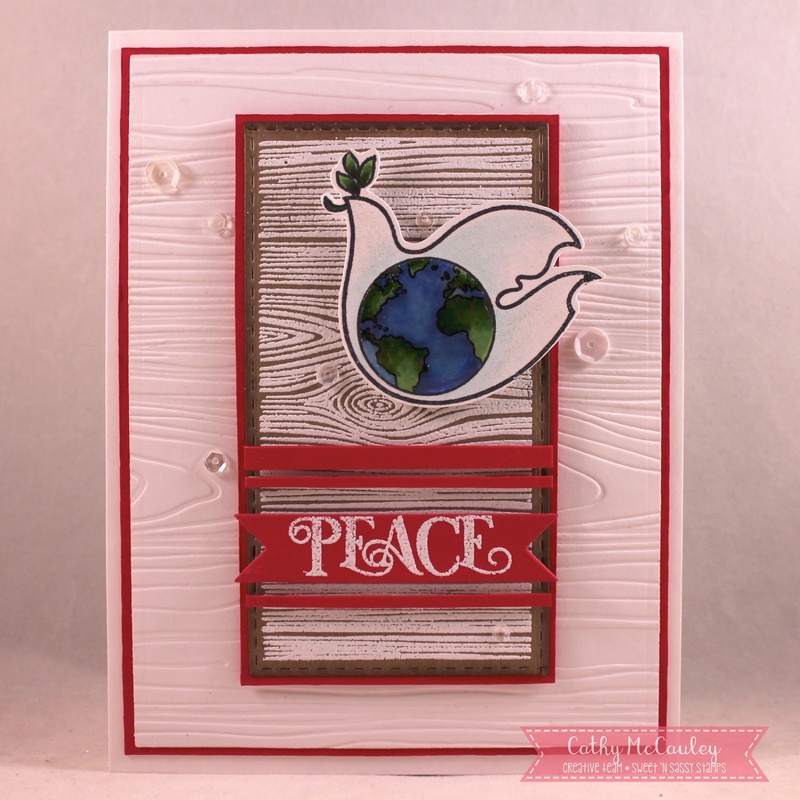 My samples use the new Peaceful Wishes stamp set. Creative Nugget: The Card Caddy & Gift Bag Dies and the Gift Bag Handles and Topper Dies were used to construct the gift box. The front of the bag was created the same way as the card above. The Gingham paper on the topper is from the Christmas Collection 2013 Paper Pad. Both projects can be seen below. 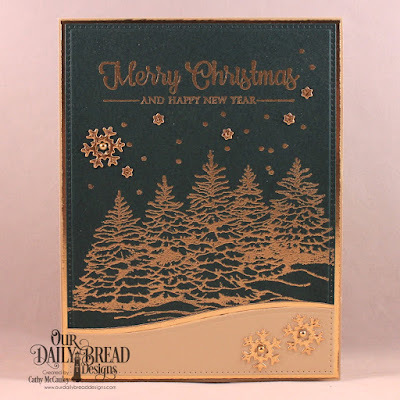 Be sure to check out the Our Daily Bread Designs Blog, Facebook Page, and Instagram to see more beautiful samples created with the December Release products by the Breadbasket Designers. Hello friends! 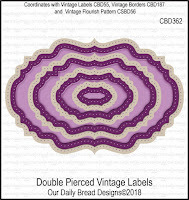 I just love the texture stamps in the Sweet 'n Sassy Stamps Store and the new Wood Backgrounds Stamp Set is no exception. 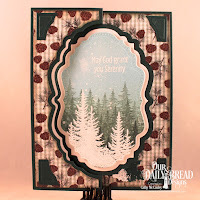 Today I'm sharing a couple of cards over on the Sweet 'n Sassy Stamps Blog using Wood Backgrounds with a few other favorites from the store. First is Wood Backgrounds with Winter Birds. 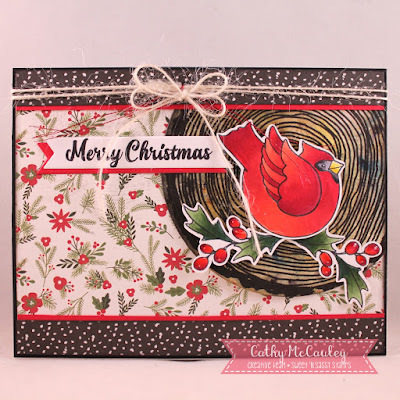 Creative Nugget: Papers from Carta Bella were used on the card base. The wood round was stamped on a mixed media panel that was sprinkled with Color Burst Powders and spritzed with water. This was cut with a circle die. 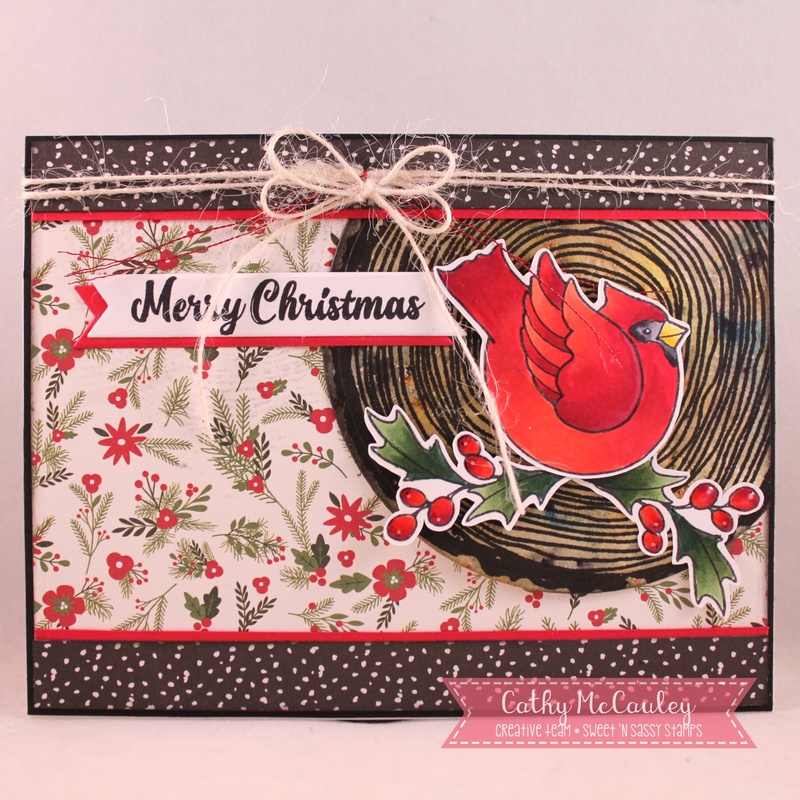 The cardinal and holly leaves from the Winter Birds stamp set were colored with Copic Markers and popped onto the Wood Background. Glossy Accents was added to the berries and the sentiment was stamped on a banner die cut to finish the card. 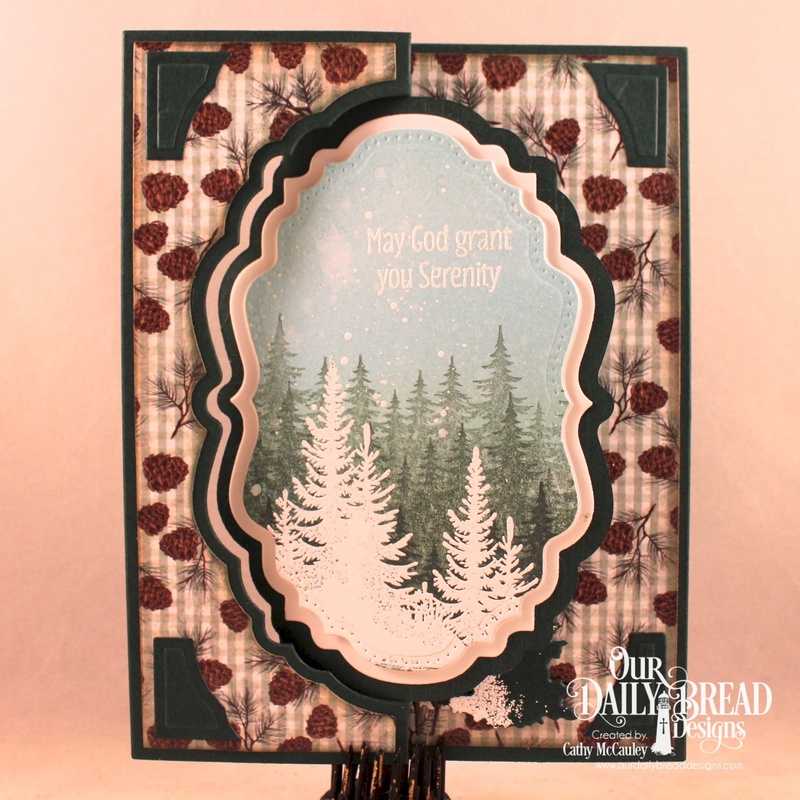 Next up is Wood Backgrounds with the new Doves of Peace stamp set. Creative Nugget: Wood texture was impressed onto the background and one of the Wood Backgrounds was white embossed on a piece of Kraft card stock cut with a Stitched Rectangle Die. One of the doves from the Doves of Peace stamp set was colored with Copic Markers, cut out and popped onto the embossed wood panel. Glossy Accents was added to the globe. The sentiment was white embossed on a red banner. Strips of red card stock and sequins were added to finish the card. 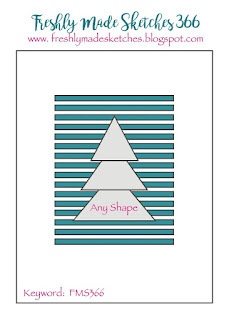 The design for this card is from Freshly Made Sketches. Thanks so much for stopping by...only 14 more days until Christmas! Hello friends! 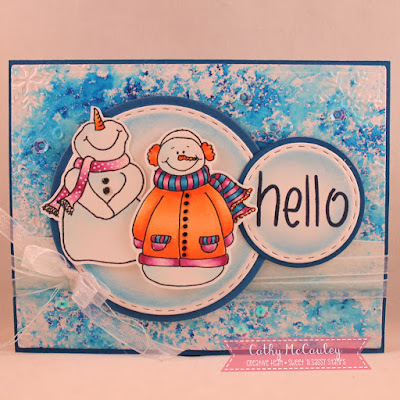 Today I'm sharing a card for several on line challenges using the adorable Crazy About Snowmen stamp set released last month by Sweet 'n Sassy Stamps. 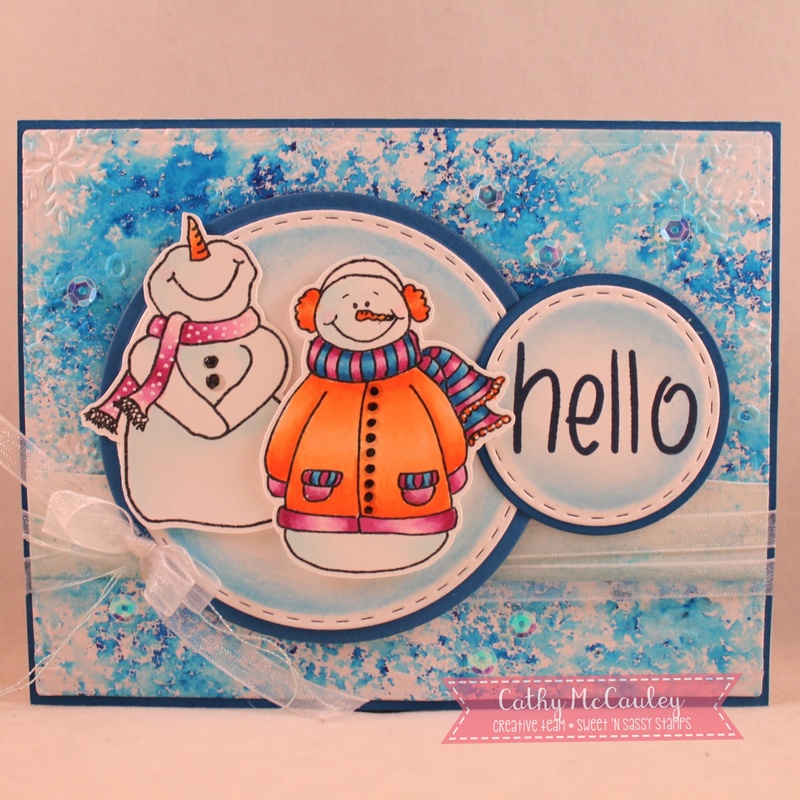 Creative Nugget: The snowy background was created by sprinkling Color Burst Powders onto a piece of Mixed Media paper and running it through my Gemini with a snowflake embossing folder to embed the powders into the paper. The panel was then spritzed with water to burst the colors. Two of the snowmen from the Crazy About Snowmen stamp set were colored with Copic Markers and popped onto a stitched circle. The "hello" sentiment was made using the Sunshine Girl Alpha. A few Sequins were added for extra sparkle to finish the card. 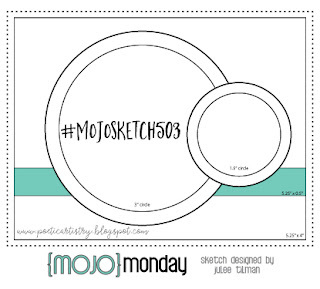 The design for this card is this week's Mojo Monday Sketch. Hello, friends! 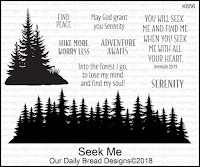 Welcome to the Our Daily Bread Designs December 2018 Release. The stamp sets being release this month feature scenes from the great outdoors and are perfect for your wintery and masculine card making needs. 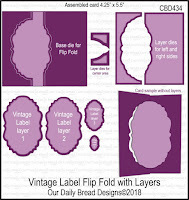 The new Vintage Label Flip Card with Layers Dies and Double Pierced Vintage Labels Dies are wonderful for matting the images and and help to make creating a fancy fold card a snap! 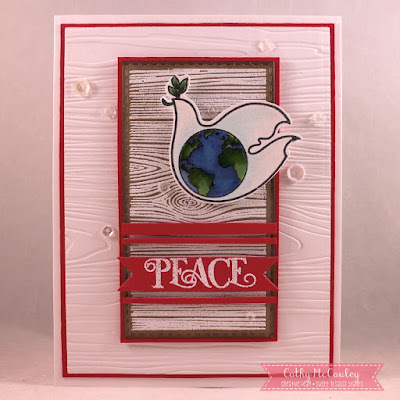 My first sample was made with the new Peaceful Wishes stamp set and the Peace & Joy Die. 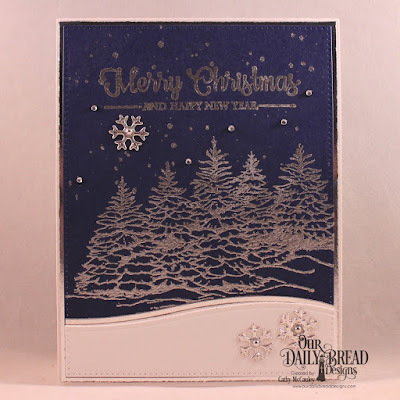 Creative Nugget: The snow covered trees from the Peaceful Wishes stamp set were colored with Copic Markers on a Pierced Rectangle cut panel and sprinkled with glittery Frosting Powder for lots of sparkle. 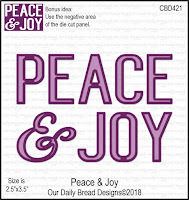 The Peace & Joy Die was used to cut the words from the panel after the trees were colored. The words were stacked five times for dimension and popped back into the panel. A few Snow Crystals Dies were used to cut snowflakes which were covered with the Frosting Powder and added to the scene to finish the card. 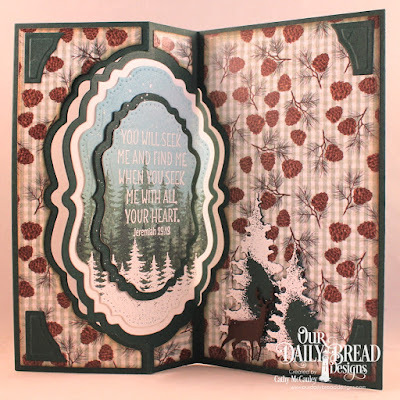 Creative Nugget: The Vintage Label Flip Fold Card with Layers Dies were used to cut the card base from green card stock and the layers from paper in the Christmas Collection 2017 Paper Pad. Green and blue Oxide Inks were sponged onto a mixed media panel and the trees from the Seek Me stamp set were stamped and white embossed on the panel which was then splattered with watered down acrylic paint. The panel was cut with a Double Pierced Vintage Label Die and mounted onto the flip card. The sentiment was white embossed. The same steps were followed for the inside of the flip panel. A smaller Double Pierced Vintage Label Die was used to cut the center from the scene and the sentiment white embossed over stamped images. The small panel was mounted to a green layer cut with a Vintage Label Die and this was popped back onto the flip card. 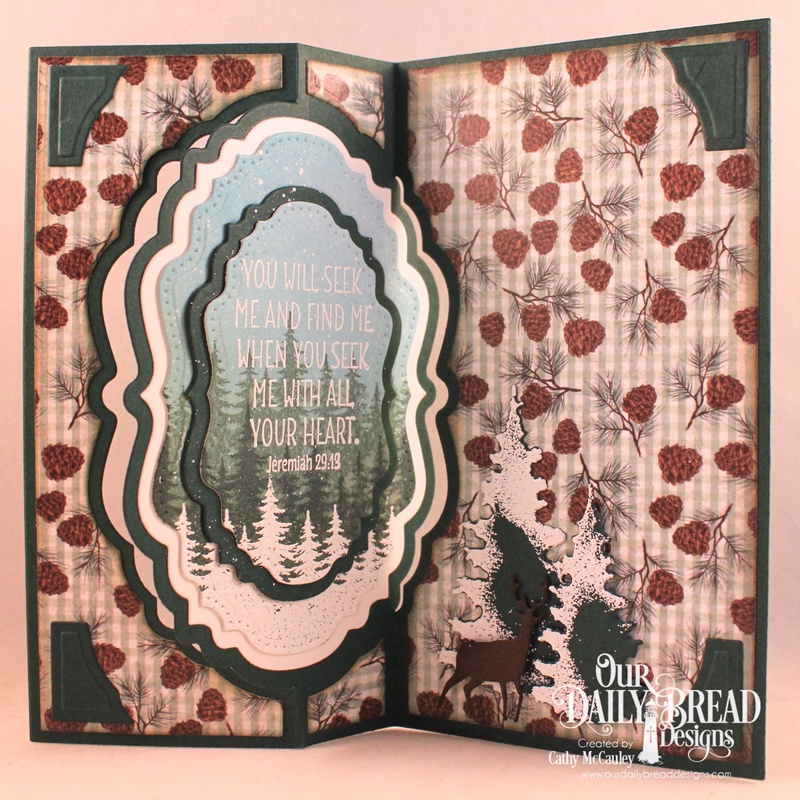 The Trees & Deer Dies were used to add accents to the inside of the card. Close up views of the stamped scenes can be seen above. 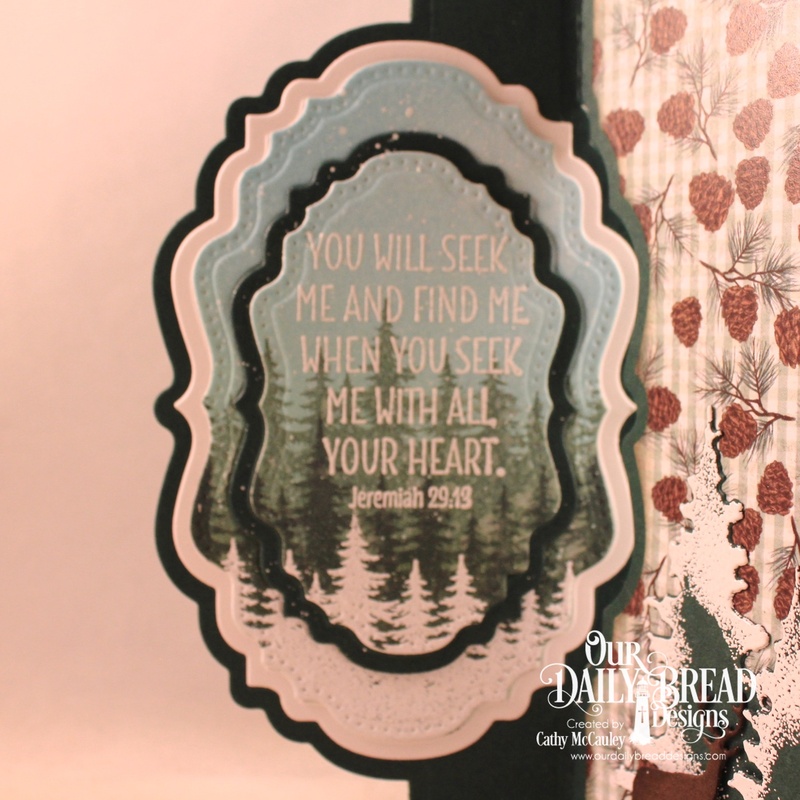 Be sure to check out the Our Daily Bread Designs Blog, Facebook Page, and Instagram to see more beautiful samples created by the Breadbasket Designers using products from the December release.